The movie Bottle Rocket has one of my favorite dialogue exchanges in all art. Dignan (Owen Wilson) says to Bob (Robert Musgrave): “Bob Mapplethorpe, potential getaway driver, go…” And after struggling to sell his character strengths, Bob says, “…I’m just not that good at this selling yourself stuff, okay, so I’m just gonna tell you the truth. I really want to be a part of this team… and I’m the only one with a car.” “That’s good. Because that hits me right here,” says Dignan, pointing to his heart. Life works much the same way for many businesses. They have a product or service that no one else has. They are earnest about building the company and truly want to improve peoples’ lives. They’re just not experts at selling themselves or generating excitement in others. This is where VYPER comes in. 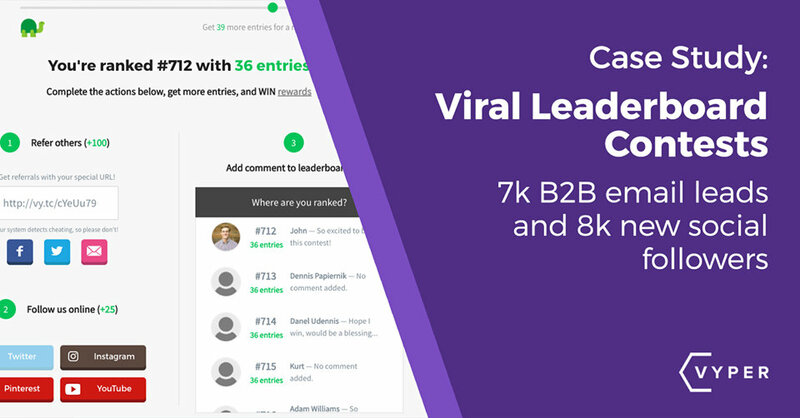 VYPER is a growth hacking toolkit – software designed to help your company create viral growth via contests, giveaways, content upgrades, popups and more. At the heart of VYPER is incentivization and gamification technology that does the heavy lifting – helping companies setup and run campaigns, and ultimately boost engagement to maximum levels. Read: VYPER grows more leads and sales for your business. VYPER equips companies to run contests designed to spark signups and referrals. The software assists with putting together the likes of a contest landing page and leaderboard. A leaderboard encourages friendly social competition and enables participants to unlock rewards according to their actions. Basically, VYPER simplifies the work of offering perks in exchange for social shares and email sing ups. For brands that don’t know how to interact with customers (potential and existing) – or can’t build engagement as much as they would like on their own – VYPER gives them the means to do so directly. VYPER puts social sharing and interaction at the core of marketing efforts. VYPER knows how to help you generate excitement and encourage brand loyalty. Why is it so important to stimulate your customers to talk you up and bring others onboard? As the team at VYPER points out, studies from the Wharton School of Business show that customers who refer others or are referred themselves have a 20% higher lifetime value than normal customers. VYPER is geared for generating phenomenal traffic through ‘word-of-mouth’ tactics. It’s built to support contests on either mobile devices or desktop. And the software takes the guesswork out of knowing when to offer bonus content or content upgrades by integrating automatic triggers based on customer action. Tired of stagnate growth? Need help expanding your email list and driving sales? Explore the VYPER toolkit in greater detail at vyper.io. Plans begin at $29 per month, and start with a free 7-day trial.